Every SharePoint developer that does TDD is desperately waiting for Microsoft to release a Version of the Microsoft.SharePoint.Emulators for SharePoint 2013. Unfortunately it seems that Microsoft does not have any plans to publish a new release in the near future. This is completely incomprehensible since there are a lot of SP2010 solutions that must be migrated to SP2013. To close the gap there is now the the nuget package SPEmulators. The source code is available in a repository on GitHub. To install SPEmulators, run the following command in the Package Manager Console: Install-Package SPEmulators. 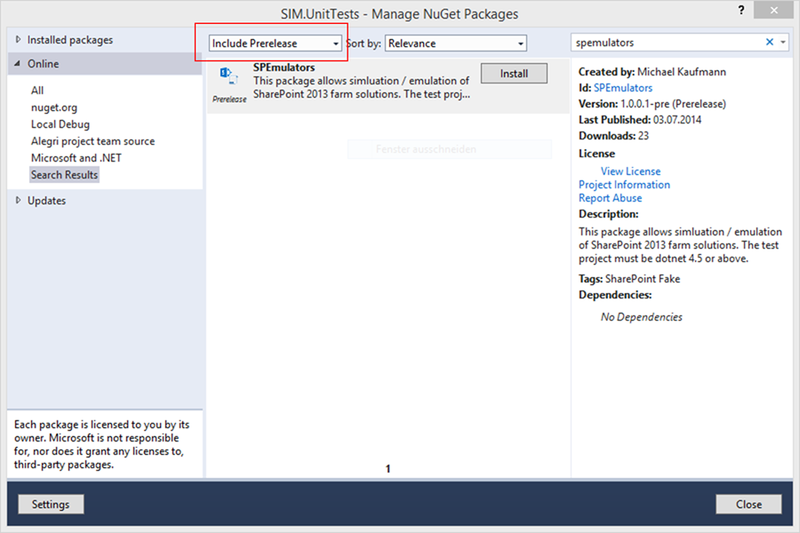 You can also search for the package in “Manage nugget packages…” and click “install”. Note: the latest stable build was created against the .net 4.5.1 (see the comments of this thread). If you want to use the package with .net 4.5 you can use the prerelease version. To use the SPEmulators framework you have to create the SPEmulationContext. The context is disposable and must be disposed after your test. You can do this in a TestCleanup-Method or within a using statement. The constructor with one argument of the type IsolationLevel is for compatibility with the Microsoft.SharePoint.Emulators. The EmulationMode Enabled maps to the IsolationLevel Fake. The emulationMode Passthrough maps to the IsolationLevel None. For new code you can use the constructor that takes to argument: the IsolationLevel and the url. Fake Indicates, that tests run against a faked SharePoint API. The code runs against sharepoint objects that do not exist and are very fast. The context provides you with a Web and a Site property that can be used to access the current web. The context also takes care of the ShimsContext. Use this mode to run fast UnitTests. Integration Indicates, that tests run against the SharePoint API as integration tests. The shim context will be initialized and the SPWeb and SPSite objects will be added to a fake SPContext. The test run against a real SharePoint web that is injected in the SPContext using Shims. Make sure to pass in a valid url and that the required lists exist in the site. The tests are slow and should be used for integration tests. None Indicates, that tests run against the SharePoint API without a shim context. No SPContext will be initialized. This is for compatibility. This mode should only be used for tests that would also run without SPEmulators. The context takes care of creating the web and site objects and injecting them to the spcontext in integration mode. You can access the web and site thru properties of the context. Since working with lists is the most common task in SharePoint the context already as a function for you that does this depending of the isolation level. You can use the function GetOrCreateList of the context to access lists in tests. The function takes the list name and type as parameters. You can also pass in an optional array of field names. If the list is generated in fake mode the fields will already be added (as simple text fields!). This will not cover all scenarios. You might have to create the list on your own. The performance varies depending of the selected isolation level. The same test might only take a view milliseconds in isolation level fake that takes some seconds in isolation mode integration. If you plan to use the same tests as unit and integration tests, its best practice to store the isolation level and url in the app settings file. This way you can easily configure all your tests by simply deploying an app.config along with your tests. Writing the tests is not different from writing tests with the Microsoft.SharePoint.Emulators. There is a lot of documentation and sample source on msdn and other blogs. I won’t cover this here in more detail. I just add a sample, how a test class could look. Intellisense is showing its there and the classes are being recognized. But nothing we’ve been able to do has fixed it. Could this also be a Problem of the .net framwork Version? The current build is on 4.5.1. I will create a new package for 4.5 this week. I can create a new build with 4.5. I will publish it until next week. I tried to change the framework to 4.5. But it seems all my dev machines on azure are on 4.5.1 and I get a build error, if I try to change the framework version of the project. I will spend some time on it this weekend. Since I had no time to test itproperly I added it as a prerelease to nuget.org.